As the weather starts to turn warmer there will naturally be hundreds of cyclists dusting off their bikes after a long winter’s nap. With the Ride Calendar now populated with a number of group rides and with more to be added this is a good time to review some basic ‘Do’s and Don’ts’ of riding in a group. DO check your air pressure, brakes, and chain prior to each ride. Preventative maintenance can help prevent a mechanical issue that could pose a problem not only for you but for other riders if you have to suddenly slow down or stop. DON’T join a ride without at least the necessities to change a flat tire (spare tube(s), tire levers, and pump/CO cartridge(s)). Each rider should be able at a minimum know how to change a flat tire. A flat tire can happen to anybody, anywhere, at any time. Other items that you may want to include in your saddle bag are patches, hex key set, and a multi-tool. DO use hand signals and calls (e.g. – ‘car back’) to indicate potential hazards. Also, make sure you pass the information forward/back as needed. Don’t assume that other riders heard or saw the original indicator. Remember – the riders in front of you and behind you are depending on You to let them know about unsafe conditions. DON’T call “Clear” at an intersection. The Club feels this is a potential liability issue. The circumstances can change by the time the last rider in the group reaches the intersection. Each rider is to make his/her own decision at each intersection. DO make sure that you sign the waiver sheet at the start of each ride. Also, introduce yourself to the Ride Leader(s) for the ride if you are not familiar with him/her. This gives the Ride Leader an idea of the size of the group and is helpful in determining if any riders are missing during the ride. DON’T leave a ride early without notifying the Ride Leader, or at the very least notifying another rider. If a rider is missing we need to know if the rider left on their own or whether there is another issue (e.g. – possibly the rider has a mechanical problem that wasn’t noticed and is back a ways and needs assistance). DO arrive at the starting location ready to depart at the indicated time. We try to keep true to the starting times so everyone knows approximately when the ride will end and can make other plans later if needed. Delaying the start for someone who is late is inconsiderate to the other riders who are ready to start at the indicated time. Example- arriving at 8:58 for a ride that starts at 9:00 when you still have to gear up and inflate your tires is NOT ‘on time’. DON’T ride in an erratic manner. The best people to ride with are those who maintain a steady pace and as straight a line as possible. Predictability is not a bad thing when riding. It gives the other riders- and cars! – a very good idea of how you are riding and they can adjust accordingly. It helps reduce indecision on the part of others if they know what you are going to do, which in turn can reduce the possibility of an accident. DO make sure that you can reasonably maintain the advertised pace of the ride. In other words, don’t “hope I can hang on”. Group rides are designed to have everyone move together at a steady pace. This can be disrupted if the group has to stop every few miles to let someone catch up (assuming the group isn’t going faster than the advertised pace). 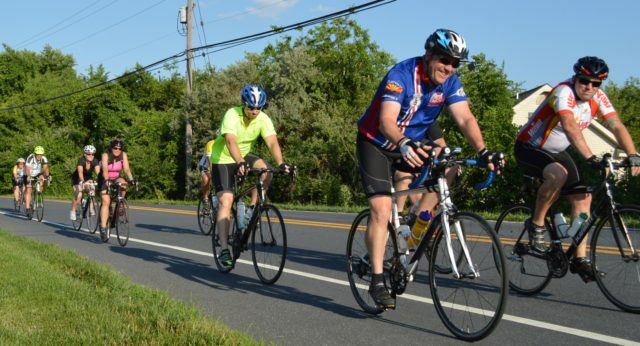 Note- rides that include some hills may be an exception, as there may be frequent planned stops to regroup. DON’T try to pull the group at a faster pace than advertised. This will splinter the group and defeats the purpose of the group ride. Also, if you are too far ahead of the group you could miss a turn and possibly get lost. If the group is slower than your ability stay with the group and search for a faster group to ride with going forward. When riding in a pace line, DO keep the line tight, but DON’T over accelerate to close any gaps. The best way to fill a gap is to ride slightly faster than the rider at the front of the gap and close the gap slowly. Over accelerating will fill the gap quickly but then you may have to use your brakes after you catch up, which can be an issue if there are other riders behind you. Mike Kealey is an avid road cyclist and is currently WCBC's Ride Captain. As Ride Captain Mike is responsible for everything related to the Club’s Ride Leaders, including being a general resource for Ride Leaders, scheduling and providing Ride Leader training, maintaining the rides listed on the Ride Calendar, maintaining a record of rides lead, confirming that Ride Leaders membership status is current, and assisting Ride Leaders with disciplinary action that may be required. ← Message From the President – Picnic Anyone?